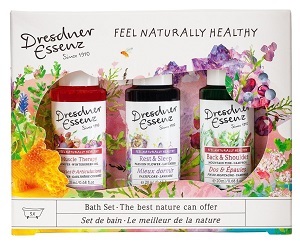 The Dresdner Essenz Feel Naturally Healthy Bath Set contains three (3) liquid baths which have been developed for health and well-being, and are formulated using natural essential oils, plant-based foaming agents, and an intensive care complex that is gentle on the skin and keeps it moisturized. The three baths included are Muscle Therapy (Juniper / Wintergreen oils), Rest & Sleep (Passion Flower / Lavender oils), and Back & Shoulder (Mountain Pine / Camphor oils). These baths are pH-skin friendly, and contain no paraffin, no mineral oils, no silicone oils, and no PEG's. For external use only and not suitable for pregnant women, babies or toddlers. Each bottle is good for 1-2 baths.